We love pizza in our house, heck who doesn't. Well making pizza skinny is not an easy task because lets face it the CHEESE is the best part and packs a hearty calorie punch. 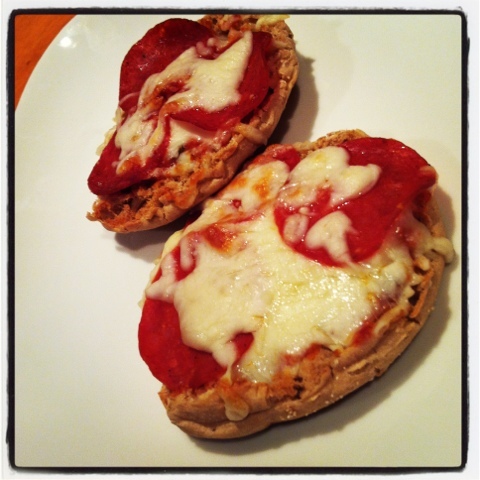 Our new favorite is make your own english muffin pizzas. You can add anything, next up I think we are going to do ham and pineapple. Yum yum. GRAND TOTAL = 208 calories!!! Add a salad to the mix and you have a great little low cal lunch. *Note I toast the muffin in the toaster before I add the toppings, then I broil them.